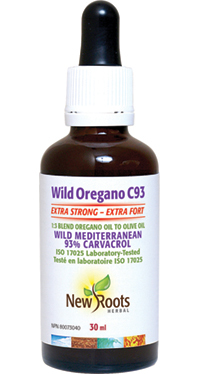 Wild Oregano Extra Strong features a potency-validated 30% concentration of our carvacrol-rich oregano oil blended with olive oil for those that prefer a more intense flavour and therapeutic effect. Adults: Put 0.16 ml (approx. 4–6 drops) under the tongue and swallow or mix with 30 ml of water or juice three to five times daily or as directed by your health-care practitioner. Take with food. If you are taking supplements containing iron, zinc, calcium, or copper, take this product a few hours before or after them. For occasional use only. Also contains: Extra-virgin certified organic olive oil.